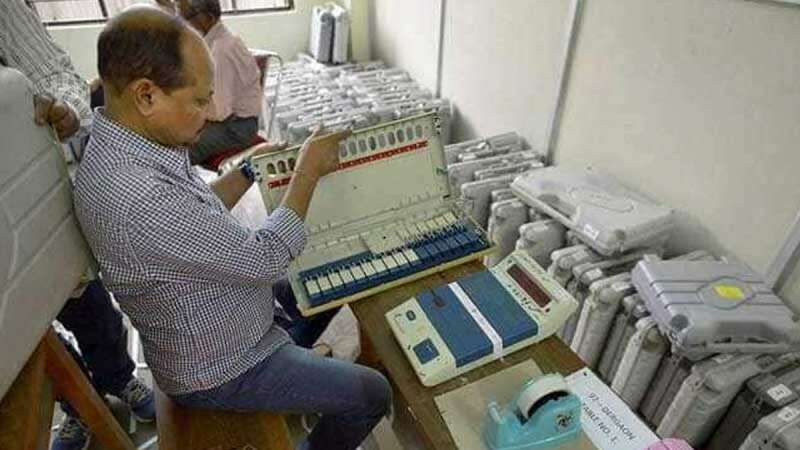 New Delhi : The Election Commission has admitted that the CCTV cameras, installed in the strongroom where electronic voting machines (EVMs) were stored, were completely blacked out during power cut in Bhopal. Opposition parties have been alleging tampering of machines during the time. The election body has also assured an action against the officers who delayed handing over of EVM machines by nothing less than two days, while they were scheduled to give it on November 28. "A report obtained from the Bhopal Collector states that CCTV cameras and an LED display installed outside the strongroom did not function from 8.19 am to 9.35 am on 30.11.2018 due to failure of electricity supply. Because of this, recording could not be done during the given time period. An additional LED screen, an inverter and a generator have been installed in order to ensure continuous electricity supply," a statement released by the poll body on Saturday read. A Congress delegation had met Election Commission on Friday raising complaints against the lacklustre attitude in carrying the EVM machines during polls in Madhya Pradesh and Chhattisgarh. The delegation also complained about suspicious people armed with laptops and mobile phones sneaking around strongrooms in Chhattisgarh's Dhamtari assembly seats on the pretext of repairing CCTVs, besides the alleged deletion of voters in Uttar Pradesh.